Take Part A (with pre-drilled hole at one end) and screw one of the ends of Part B into the ball end of Part A. 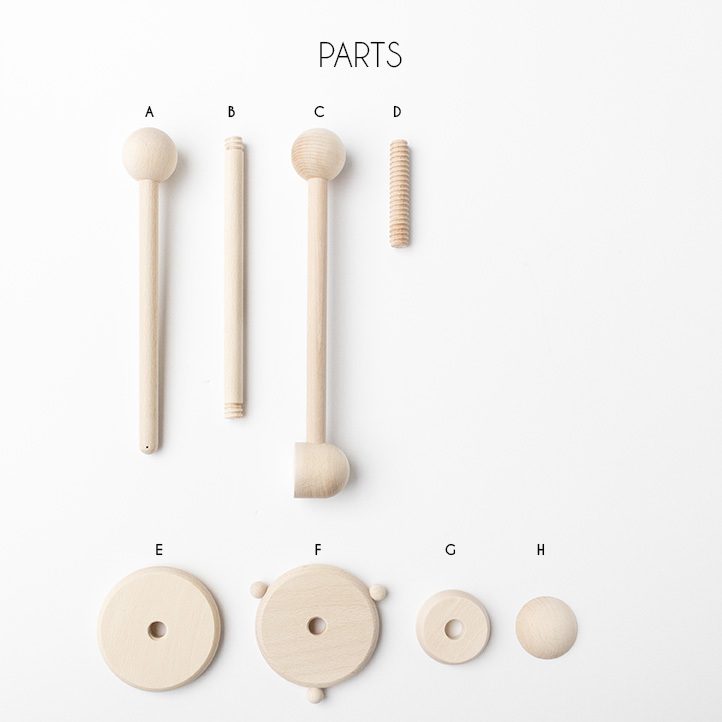 · The pre-drilled hole at one of the ends of Part A is the point where you hang your baby mobile. You can thread a cord or attach a screw eye (not included) to hang your mobile. · To use it with The Felting Dorcas’ felt ball mobile, you may wind the top string around this end after pushing down the cluster of balls at the top of the mobile to the intersection of the 2 arches. Screw the other end of Part B into the ball end of Part C to form an “L” shape. Take Part D and screw it all the way into the internal thread of Part C until the end. Screw Part E over the threads of Part D until it stops at the side of Part C.
Place Part E against your cot slat and screw Part F on the other side of the slat over the threads of Part D, ensuring Parts E and F press firmly against both sides of the cot slat. Place Part G next to Part F followed by screwing Part H over the threads of Part D to close. This has only a decorative purpose, you may use only Part H or Parts G and H together, or not at all, depending on the look you like for the stand. Your cot slat will be between Parts E and F.
· Please ensure all parts are firmly screwed and installed into place and perform regular checks on the attachment of the stand to the cot. · Please ensure both the stand and the baby mobile attached to it are always kept out of the reach of the baby or young children. · Do not attach the stand and the baby mobile within the baby’s reach or in a place where it could be moved out of place by baby or children. · Discontinue the use of the stand and the baby mobile or hang the baby mobile from the ceiling at a height out of reach once the baby is capable of sitting or standing by herself/himself in the bed, or is capable of reaching and grabbing the stand or the baby mobile. · Discontinue the use of the stand if there is any damage noticed.